I have a fun tutorial for an American Girl doll. 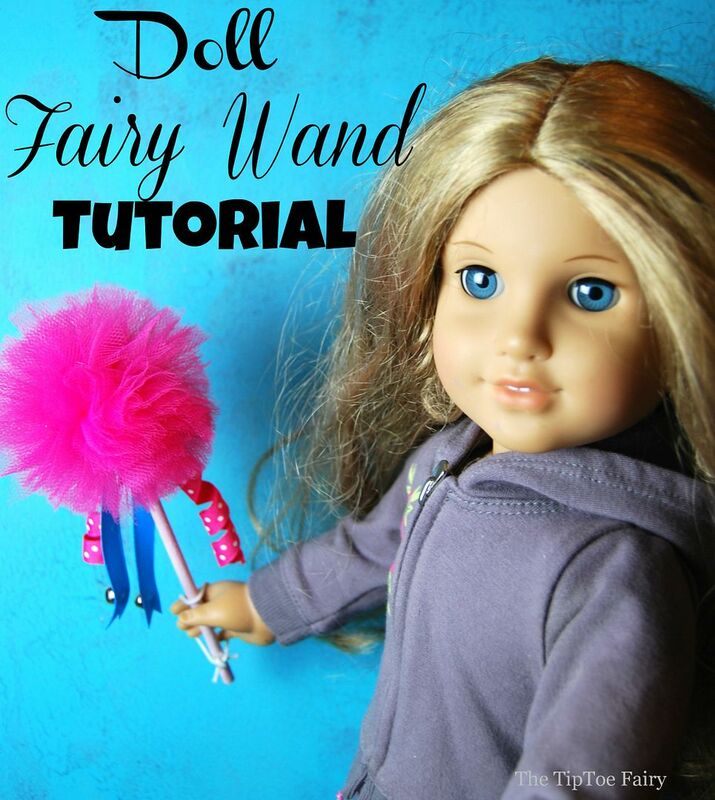 This is a doll fairy wand tutorial. With a little help from a grown up, your kids will have a blast making these. 1. Cut two circle donut shapes out of cardboard or card stock. These need to be about 3.75 inches in diameter and the middle hole should be about 1-inch wide. They do not have to be perfect, just as close in size as possible. 2. Place the two donuts together on top of each other, so it looks like one. Then, take a 2-yd length of tulle and wrap it around the donut. 3. Next, take scissors and cut the tulle all around the edge. 4. Now the cardboard and tulle will look like a puff ball. 5. Cut a piece of tulle about 6 inches long and insert it between the two pieces of cardboard and tie it tightly around all the tulle. Snip the edges to be the same length as the puff ball. 6. Remove the cardboard donuts. 7. Cut a 1/4-inch dowel rod into 6-inch wand pieces. 8. Paint the 6-inch wand piece and allow to dry. 9. Glue 2 pieces of 6-inch ribbon in a cross. 10. Glue bells to one of the ribbons. 11. Glue the center of the ribbons to the very top of the wand piece. 12. Look for the knot where the tulle was tied in the middle of the tulle pom pom. Add some hot glue and attach it to the top of the wand. Then, rearrange the fluff to hide it. 13. Cut a 3-inch piece of round elastic. Tie a knot, then attach it with hot glue by the knot about 1 inch above the bottom of the wand. Allow to dry. 14. When attaching it to the doll hand, pull it to the side like the picture above, so it will form 2 loops. Slide both loops onto the hand. Now that you’ve made a fairy wand, try a pair of fairy wings or a tutu to complete the outfit! I love your fairy wand! Adorable!! My daughter and I love the wings in pinkl! My favorite accessory is SHOES!! I love doll shoes! they both love nature and the out of doors, now if winter would just move on out… thanks for the fairy wand tutorial. I would love these wings! I think they would be my daughter’s favorite!! I love the wand and the wings! My daughter would probably love to try making the wand–great tutorial! The fairy wings are awesome! My FAV accessories are shoes/boots — they just MAKE an outfit!!! I love the wands. I love to make things like furniture. We made a chair for my nieces doll. We also made a wheelchair. What a cute tutorial for the wand and wings…the green one looks perfect for Mardi Gras! I LOVE the fairy wings and wand!! Thanks so much for hosting this give-away! My favorite accessory is hats and purses. The fairy wand it so cute! This is such a cute idea. My daughter will love it! I think the wings are very cute. My daughter would love them. The tutorial will be so easy to follow and I would love to share it with my niece. Those are adorable! I have boys, but sometimes I get to play with friends’ kids and get some girly time in! I love all of the shoes for the American girl dolls! Super cute! That is the cutest little wand and wings for the doll. I love your fairy wings, they are so cute and of course then our girl would need the fairy wand, I love your ideas and thank you for sharing how to make the wand. Love those wings! they are super cute! Those fairy wings have to be close to the top! How cute are those! Love them! When I was younger, all I needed was a brush. I loved combing all of my doll’s hair! I love the fairy wings! My favorite accessory is the new colored fake-hair clips! They are so funky! This is a great idea! I love the wings and the wand. Shoes are my favorite American Girl accessory. I love their furniture and trunks. My daughter loves Molly’s glasses! She wears glasses too. Those are adorable! They’d match my daughter’s fairy outfit she has perfectly! Adorable fairy wand, definitely on the list to make! Hope I can win the American Girl Doll Summer Wardrobe! My daughter would be so excited. We have hardly any clothes for her doll. I love the adorable pom pom! Now I finally know what to do with all that material from my mom’s square dance underskirt thing. I could make thousands of these fairy wands. I love this! I’m so glad that I found you through the AG Summer Wardrobe Giveaway! I’ll be back, a LOT. That is a supper cute idea! Wow. Puffy! I’ve never made pompoms with tulle before. So cute! 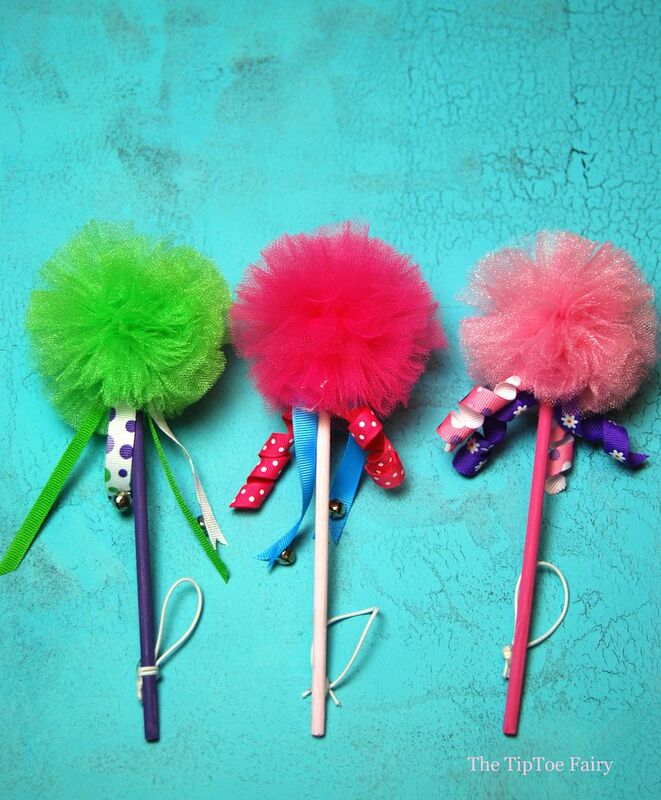 I never would have thought to use tulle for a pom pom! Hi! Oh my goodness, I LOVE this idea! “Pinned” for future crafting with my girlfriend. Thank-you for this fun tutorial! I love it! This would be a perfect activity for my daughter’s doll-themed birthday party. So darn adorable, you make it look easy to make this sweet wand . Accessories make the outfit. Love this idea. I am a crafty person and would definitely try this! Very cute wand! Thank you! How cute is this Fairy wand, really neat and your instructions were very good and easy to follow, granddaughter made a similar one related to what I had here in the house and she loves it, thank you for sharing. I love fairies and this is such a cute easy craft to make with the kiddos !! That is really cute! I can’t believe that I can actually make this stuff. 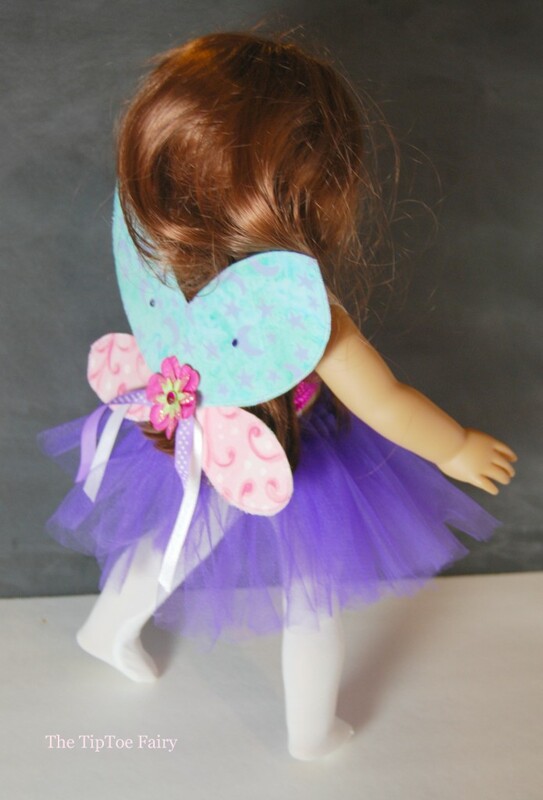 My Daughter would love this wand, fairy wings and tutu for her doll. I look forward to making these wands with my granddaughters for their American Girl dolls – they will love them. Absolutely adorable! My daughter will LOVE this idea! Love the creativity of using tulle as the top of the wand instead of the traditional star!